September 12, 2017: My summer, eclipsed by all the music. Goodbye Wm. 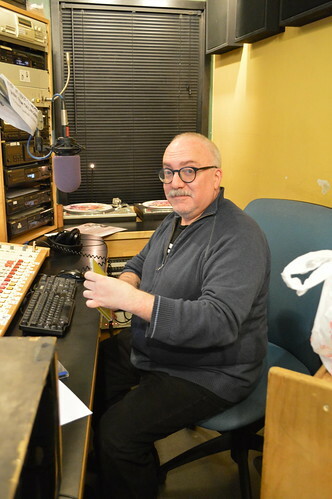 Berger.You'll always be a crucial part of WFMU's heart! welcome back! alright, traffic opener! Yes, agree with Sean, very glad to have you back. hi irene.jim capaldisome nice touches on the skins! traffic's drummer! Hi Sean, steve, Andrew and Mike! So good to be back. And nice to have you here in daylight hours, Sean. Glad your ballpark tour has been going well. why do I have to be reminded how much I enjoy Traffic? ,,,,My summer was eclipsed by idiotic government weather modification . Good photo . Irene ,,, = ahhh ,, I feel right @ home Irene in the evening . a " breath of fresh air " THE free form WFMU ! Irene, this trip has reached biblical proportions, again it will be torture when it's time to head home. HI KP, phat, david and Tome! Just settling in. 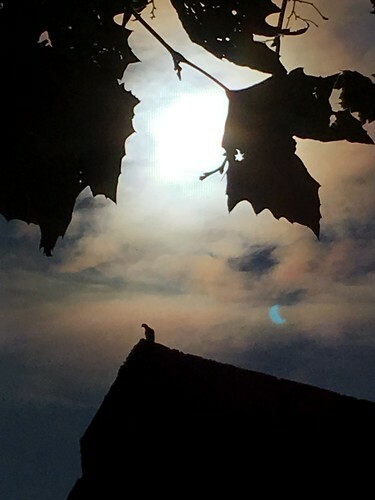 Tonight's photo, by the way, is a picture I took with my iPhone during the eclipse. I was trying to do a "selfie" and not look, and this thing of beauty popped out. Of course Irene, with this question I am not at all hinting at anything but have you heard Steven Wilson's latest offering? I am so loving summer's end ( well it's not over yet ) and your show as always I only wish I was at that "point" to take those "surreal photos = awesome .. Welcome back, Irene, and all hail Offa Rex! Hooray, Irene is back on the schedule! ..agrees with the above wholeheartedly . Hi redkayak, kid & JakeGould! I've missed you all, and am a little shaky tonight. Apologies for my flubs in advance. Sean, I have not had a chance to hear Steven's latest. Any suggestions? Hi Irene! 1st time hearing your show. Earned yourself a new listener today! Keep it up please! Good evening all. Nice to hear you again Irene. I see Larry Grenadier up here; he lives in Kingston, and he's fantastic! @skum2, what time is it there? HI Number six (and welcome)! Hi also to you, Henry, Upsetter and skum2. Nice to know I'm reaching far and wide. Henry, I knew that about Larry Grenadier. He's also married to one of my favorite singers, Rebecca Martin. Irene, got to dash, wonderful to have you back, will catch the rest of the show via archive. Hi Irene and all. That leaf is how I feel. Hanging on and roughed up. Irene is on the air again, where she belongs, and all is right with the world! Welcome back, Sweetie! Thanks Cooh John and Peter! Catch you soon Sean, and safe travels! Hi Irene, nice to see you back! This track is beautiful, but is it really called "Everything Music Go"? Thanks for playing my favorite Barleycorn tune. Lucky (and old) enough to see them at StonyBrook during that tour. Great show. Okay it's fixed, Mr. Editor. I did warn about flubs at the beginning of the show, didn't I? Hi Marc 15, jake, mr_mikeK and Kevin. Hi Irene. Nice to hear you! it's finally cool enough to throw the windows open for some fresh air, just like your show, Irene. welcome back. Thanks for the lullabies. Closing my eyes. Hi, Irene. Welcome back. Not a request as such, but I notice it's been 14 years since the passing of Johnny Cash. Yes, joe, I dedicate this to William. Hadn't heard it in a while. Heehee, KP. Hello Irene. I'm glad you're back on the air. Irene - If you haven't heard it yet check out Bill MacKay's album "Esker"
Welcome back Irene! That R. Wyatt record is a good one. Every time I listen to it I like it more! Yes, it's unfortunately true. That's why I'm a bit rattled tonight. We're not making it widely known until Ken posts something on the website. I'm starting an archive show for him at midnight. I have no words. @Irene: Gotcha. Do you feel like removing my comment? If so, whatever works best. No, it's okay Jake. The World will know soon. Wow! So very sad. All the best, Irene. Be strong. Cherish your memories. Oh, man. That's awful news. We will all miss him. Please send love to his family from all of us here.